Over the last several decades, the economic transformation of the South has led to demographic changes in which many Jews have left small towns and cities. This movement has led to the decline and, in some cases, extinction of small Southern Jewish communities. However, these demographic developments have also given birth to new communities and congregations, as in seen in the emergent Jewish community of Dahlonega, Georgia. 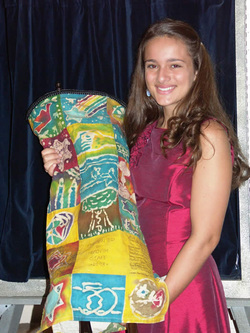 Rachel Glazer celebrates her 2007 Bat Mitzvah in Dahlonega. Photo courtesy of Arthur Glazer. Located in the hills of north Georgia, Temple Shalom B’harim is a pioneer congregation, bringing Jewish religious life to an area that previously had very little, if any at all. According to the exhaustive study of America’s Jewish population done by Harry Linfield, there were no Jews living in Dahlonega in 1937, while only 11 lived in nearby Gainesville. In the 1980s, the isolated Jews of upcountry Georgia began to lay the foundation of a future Jewish community. The current congregation first met at the end of the 20th century, adopting the name Shalom B’harim – Hebrew for “Peace in the Mountains.” Beginning in 2003, the congregation officially began holding religious services in the Dahlonega Presbyterian Church. In recent years, High Holiday services have been held at nearby Camp Coleman, a summer camp affiliated with the Union for Reform Judaism.Though Temple Shalom B’harim is based in Dahlonega, its membership spans a 35-mile radius around the small town of roughly 3,000 people. Approximately 40 to 60 people attend its monthly services, with 80 to 110 attending during the High Holidays. The congregation has 50 member families. Temple Shalom B’harim belies the trend of decline and disappearance of small Southern Jewish communities. It nourishes hope for growth of other Jewish communities. Past President Eliot Brass believes the congregation can only grow from its present state and Molly Glazer contends the membership is getting younger. The future may even hold the construction of a permanent synagogue. 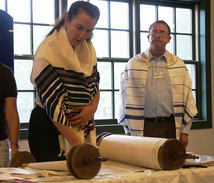 But for now, Dahlonega is a living example of Jewish rebirth in the modern South.